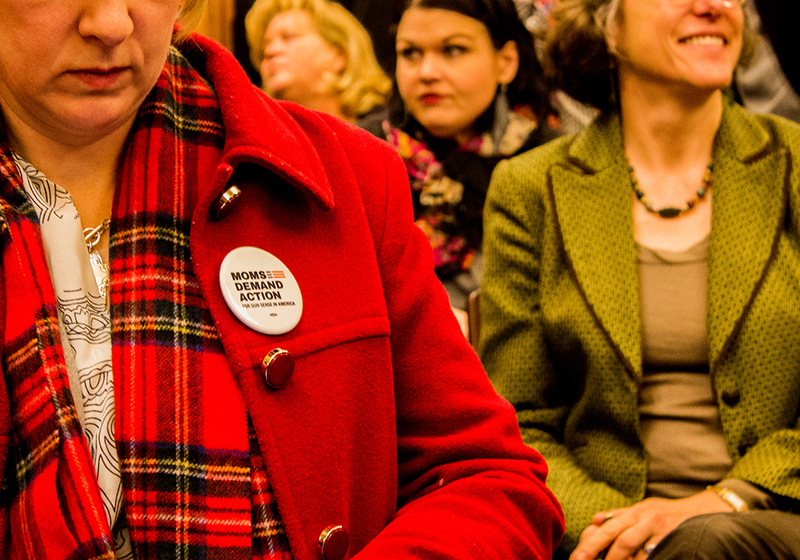 Freedom of Speech Returns to Kansas Universities? 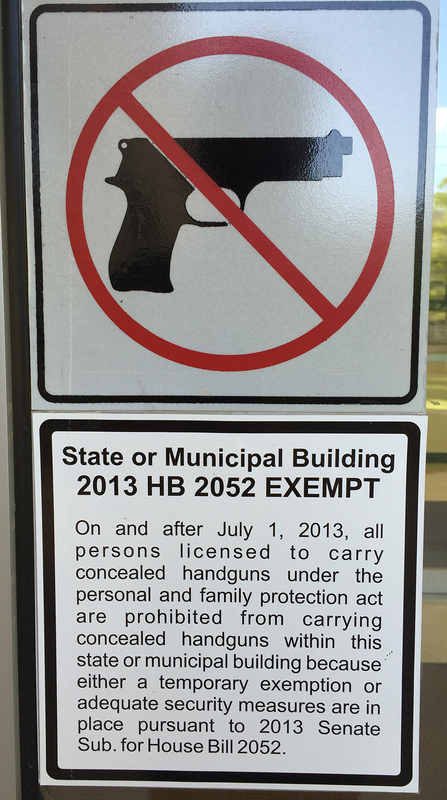 Good news for employees of Kansas universities. Freedom of speech appears to have been restored! 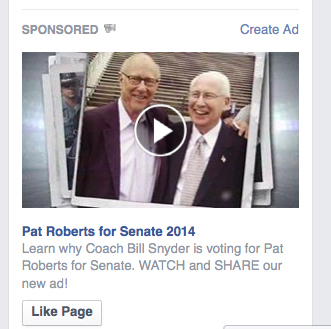 So, then, what of Coach Bill Snyder’s public endorsement of Senator Pat Roberts? Does it violate either policy? If not, then what precedent does it set? 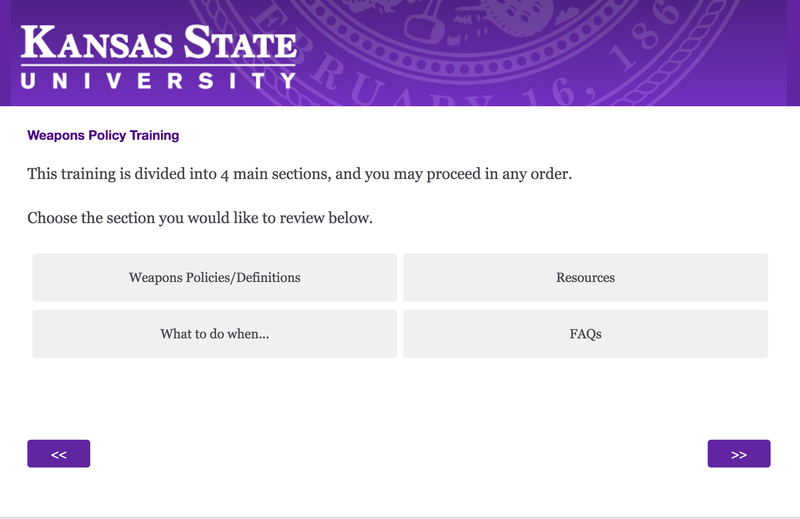 Given the lack of public criticism from either the Regents or Kansas State University, it seems to suggest that outspokenness is welcome. But does this violate the “political activity” policy? 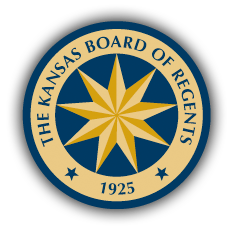 I asked the Kansas Board of Regents yesterday. To clarify, I followed up with this question. The Regents did not answer that one. 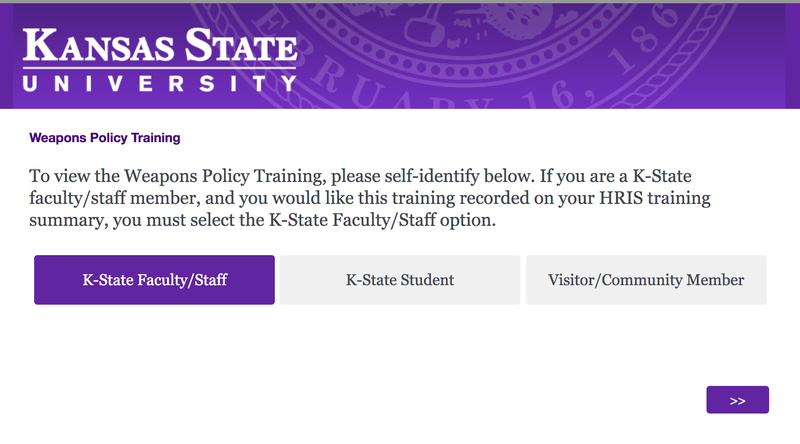 This morning, however, President Kirk Schulz issued a “reminder about university policy,” which does offer an answer: “Kansas State University does not endorse political candidates, and employees do not speak for the university when they endorse candidates. 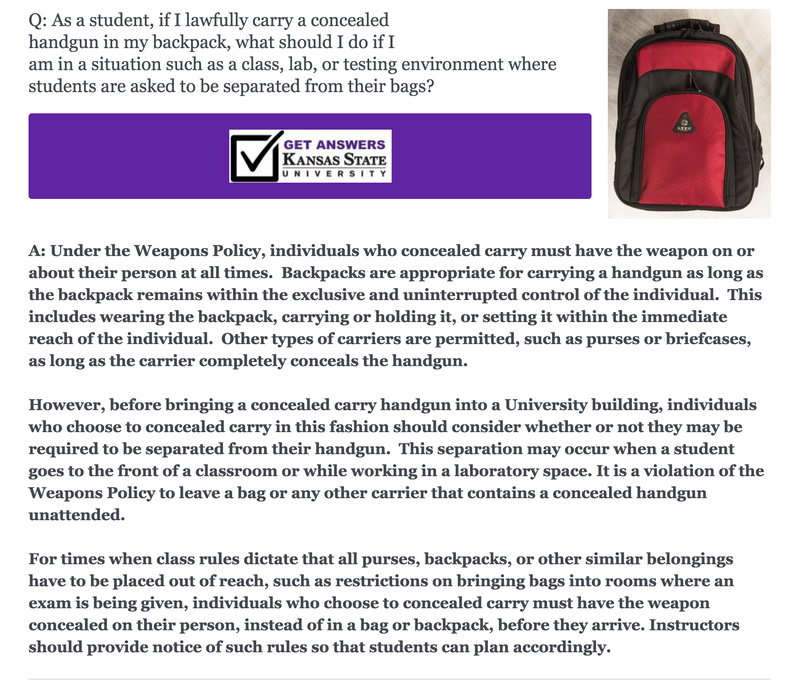 Employees should also avoid using their university-affiliation in any endorsements or statements.” On the one hand, since Snyder’s university affiliation is not specifically named in the advertisements, his endorsement is within the letter of the law. On the other hand, this statement distances the university from Snyder’s endorsement and reminds university employees that they should “avoid using their affiliation” in public statements on political candidates. 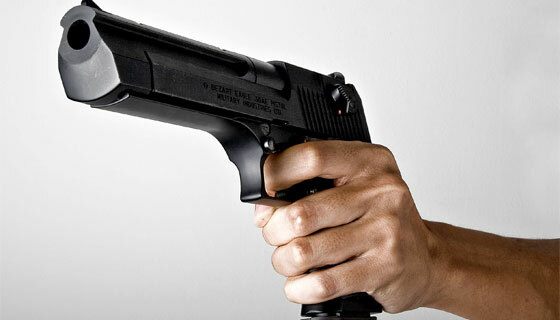 In the video below, some of the photos indicate that Snyder and Roberts were taken at K-State. 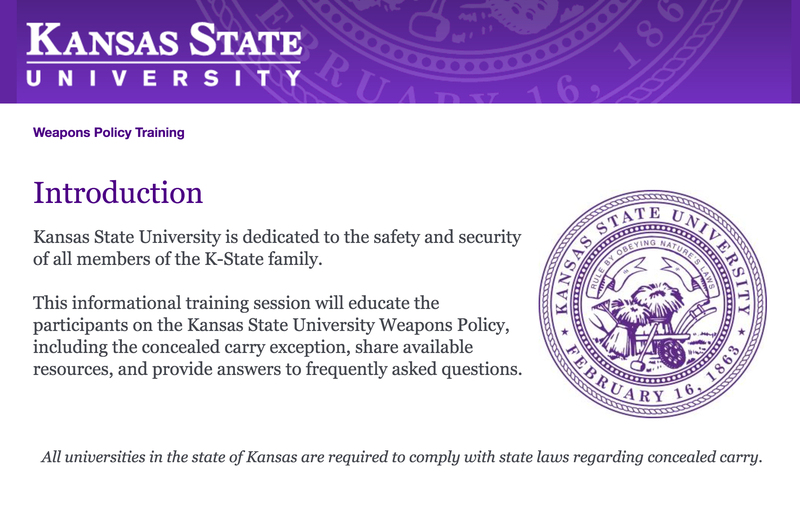 And, of course, that word Coach can only be meaningful in the context of “Kansas State University” — even if you omit those three words, they’re there by implication. What I take away from this is that, though President Schulz isn’t crazy about the idea, faculty can endorse any political candidate they like and can use their title in doing so. 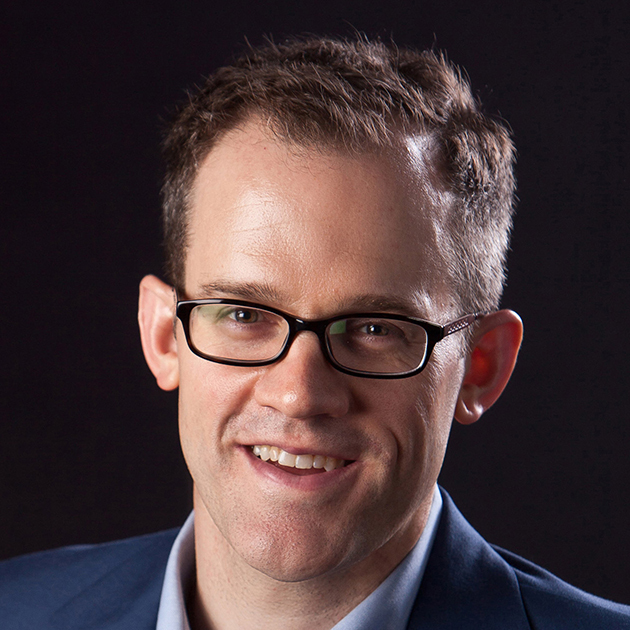 So, for instance, a sentence like “University Distinguished Professor Philip Nel endorses Paul Davis for Governor of Kansas” is acceptable speech — even if President Schulz would prefer that such statements were not made. 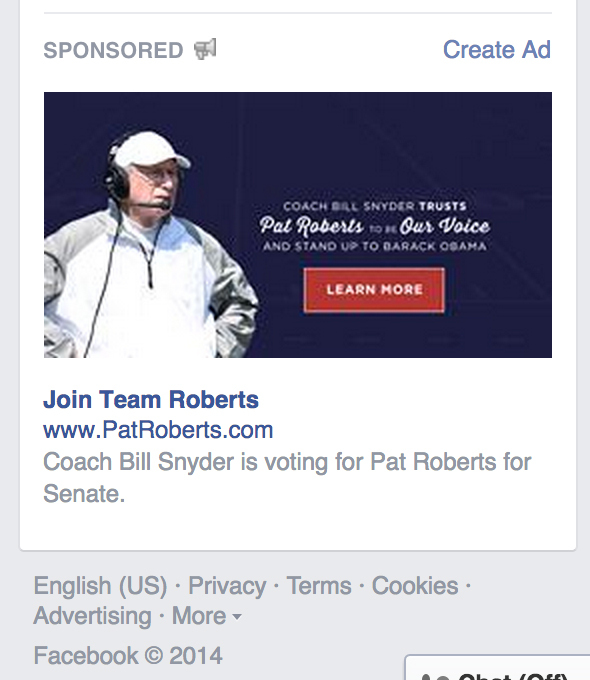 As evidence, I would point to the Coach-Snyder-for-Pat-Roberts advertisements appearing on Facebook today. 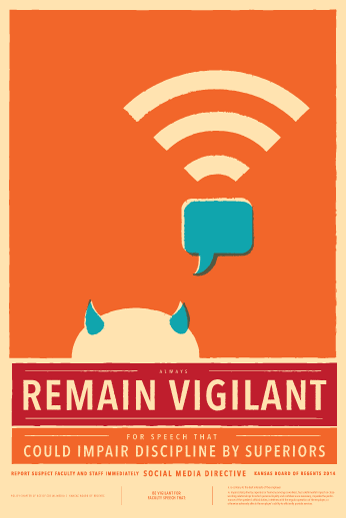 That this passes muster with the architects of the social media policy is also welcome news. 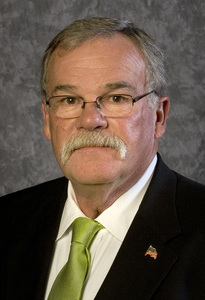 For example, in the ad, Coach Snyder says that Senator Roberts is “as good as it gets for the state of Kansas,” is “a great friend of the state of Kansas,” and “he genuinely cares about the people of the state of Kansas.” As anyone who has followed the Senator’s career in government knows, he’s an advocate of torture, in favor of workplace discrimination, against student loan affordability, and believes that guns are more important than human lives (or, at least, that massacres like Sandy Hook are acceptable collateral damage). Now, it strikes me as at least possible that some people might look at Roberts’ record and say that the university’s most famous employee’s endorsement of such record is “contrary to the best interests of the employer.” I mean, one presumes that Kansas State University might want to stand against workplace discrimination, for student loan affordability, and might even want to prevent a Virginia-Tech-style massacre on its campus. Evidently, though, Coach Snyder’s employer would prefer that he not make such statements, but is unwilling to take any public action against him. The most intriguing line of Coach Snyder’s endorsement is his claim that Senator Roberts is “an honest individual.” His campaign advertisements against Greg Orman and statements in debates all provide ample evidence to the contrary. His ads allege that a vote for Orman would be a vote for President Obama, but in fact Orman (running as an independent) has said he will caucus with whichever party wins the Senate. 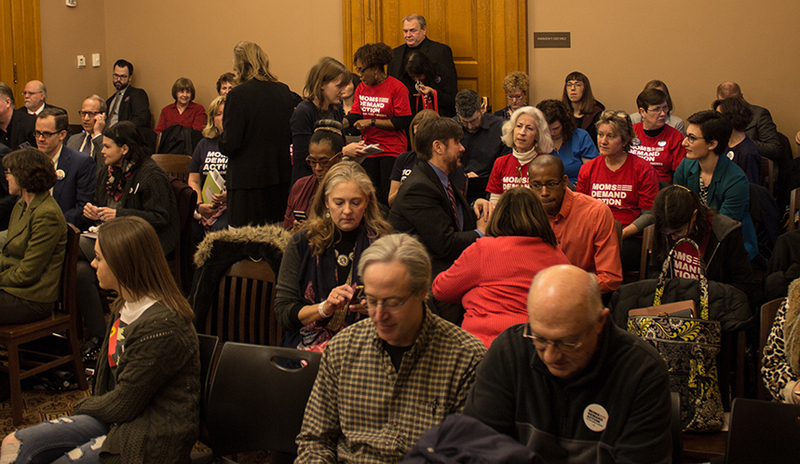 Roberts said he missed a Senate committee hearing on Sept. 16 about on threat of the Ebola outbreak because “The hearing was held out of session, during September.” However, as The Kansas City Star points out, “The Senate was in session that day.” Roberts misses quite a few votes, actually — and most of those he attends are simply to vote “no” (on immigration reform, on Steven Burns as a new member of the Nuclear Regulatory Commission, etc.). 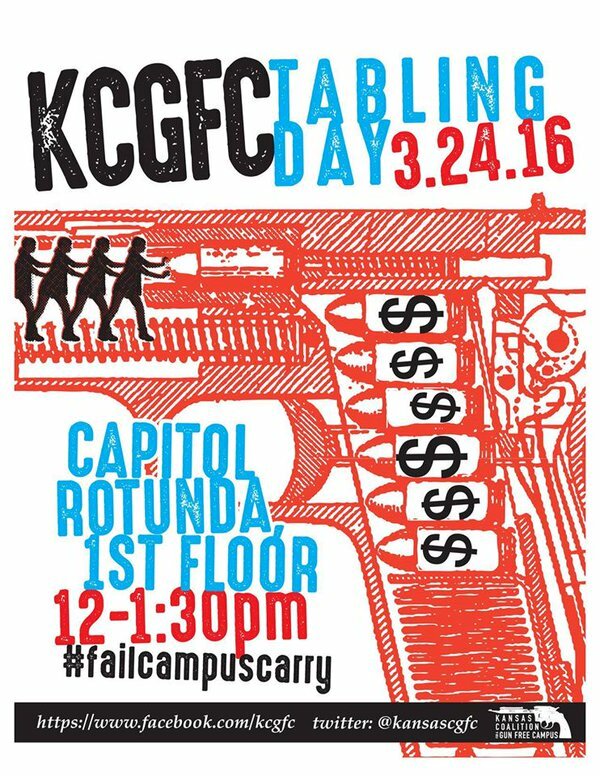 “Kansas State University Demands Pat Roberts Stop Running Ad. 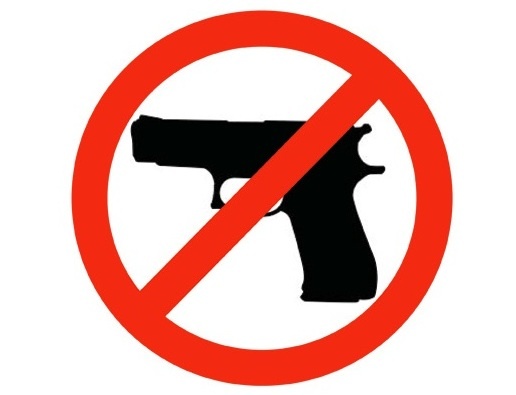 Roberts Refuses,” DailyKos, 31 Oct. 2014. The headline is true. This part of the story (right at the end) is unsubstantiated but intriguing: “Sources at KSU are telling me that Bill Snyder was stopped in a parking lot after a game by a young republican tracker who filmed him to ask him why he supported Pat Roberts. This was (reportedly) not professionally done, and Bill Snyder was not in any way aware that this would be used for an ad or anything else – at least that is what is being inferred.” The Hutchinson News has also picked up the “headline” part of this story. 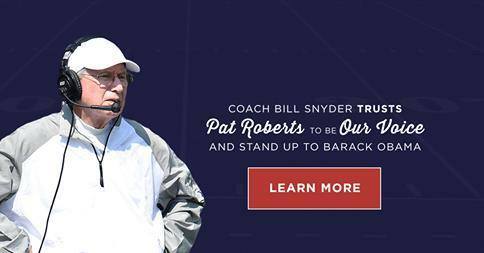 “Honor K-State and Coach Snyder’s Request to pull the illegal and unauthorized political advertisement.” Change.org petition asking Pat Roberts’ campaign to pull the ad. 31 Oct. 2014.